Abu Dhabi: Sri Lanka is reviving the historic silk route, which was used by Arabs to explore Asia with the opening of a new seaport in southern Hambantota last week, according to the Sri Lankan Ambassador to the UAE. 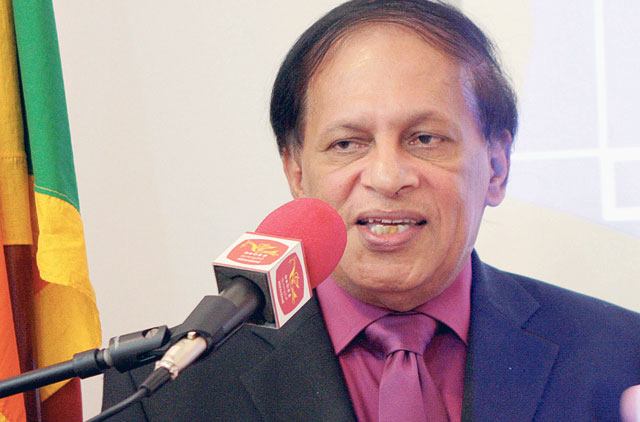 Reviving the silk route means it will greatly benefit the Middle East, Sarath Wije Singhe said at a discussion meeting at the Sri Lankan Embassy in Abu Dhabi recently. Sri Lanka unveiled the Hambantota seaport yesterday, which was built with Chinese assistance as part of a $6 billion (Dh22.04 billion) drive to rebuild infrastructure after the war. The government hopes the port will get business from some of the 36,000 ships that cross the Indian Ocean each year. The first ships will arrive in November. Sri Lanka has been maintaining trade links with the Middle East for thousands of years and the ‘revival of the Silk Route' will help the ships from the region, especially the UAE, the ambassador told Gulf News on the sidelines of the meeting. "We want closer relations with the Middle East, Russia, China and India than the West," he said. Dr Priyantha Gunaratna, Marine Projects Specialist, Coastal Zone and Waterways Management Section at Dubai Municipality made a presentation on the project. A port free zone which will come up soon as part of the project will also give opportunities for investors from the Middle East, he told Gulf News. A port was first known to be operational in the general area of Hambantota around 250BC, when Chinese and Arabian merchants used it as part of the maritime silk route, according to his presentation. Sri Lanka is situated along the key shipping route between the Malacca Straits and the Suez Canal, which links Asia and Europe. The only existing major port in Sri Lanka, the Port of Colombo is catered towards container handling and is unable to provide facilities for port-related industries and services. The new port will help relieve pressure on the Colombo port, and also provide services to ships that normally take three-and-a-half-day detours from their shipping lanes to receive these services, including refuelling, maintenance, logistics and buying provisions and medical supplies. The Hambantota Port is being constructed by the Chinese companies China Harbour Engineering Company and Sinohydro Corporation. The total cost of the first phase of the project is estimated at $360 million, including $76.5 million for the bunker terminal. About 85 per cent of the funding is provided by the Chinese Government and the remaining 15 per cent by the Sri Lanka Ports Authority. The project is currently five months ahead of schedule, and is scheduled to be completed by November. A $550 million tax-free port zone is being set up with local and international companies expressing interest in shipbuilding, ship-repair and warehousing facilities. The project is expected to provide employment to over 50,000 people. $76.5 million- cost of bunker terminal. The Chinese funding for the Hambantota Port will not affect Sri Lanka's relations with India, Dr Priyantha Gunaratna told Gulf News. India is already helping Sri Lanka to build an airport, he said. Chinese help is similar in nature, Gunaratna said. "And Sri Lanka is maintaining excellent relations with India," he said. The Sri Lankan government has said the ever-deepening ties with China are purely commercial. But the media reports said that some geopolitical analysts speculated that this port's future phases might afford Beijing a naval facility, a prospect that worries Sri Lanka's close neighbour and major benefactor, India. The $600 million (Dh2.2 billion) second phase of the Port of Hambantota project will include a container terminal, which will be completed by 2014, according to the presentation made by Dr Priyantha Gunaratna. The third phase will include a dockyard. Upon completion, the port will cover 4,000 acres of land and accommodate 33 vessels at any given time, making it the second largest port in South Asia. The construction of the Port of Hambantota is part of a larger development project centered around the Hambantota District. Apart of the port, the project consists of the construction of an international airport, a highway, a railway, an oil refinery and related facilities. The new airport will initially handle cargo related to the port, with plans for later expansion. Related to the project, a 500-acre Safari Park is being constructed in Ridiyagama, Ambalantota scheduled to be open in 2011. An international cricket stadium is also under construction in the area, and will host two fixtures at the upcoming 2011 World Cup. The $600 million second phase of the Port of Hambantota project will include a container terminal, which will be completed by 2014, according to the presentation made by Dr. Priyantha Gunaratna. The third phase will include a dockyard. An international cricket stadium is also under construction in the area, and will host 2 fixtures at the upcoming 2011 World Cup.